The Doublecross has come and gone and it was a great one for the Club and the participants! This was the Club’s 32nd Annual Doublecross and it was well attended with nearly 370 registrants. Have you ever wondered what goes into putting on an event like this? 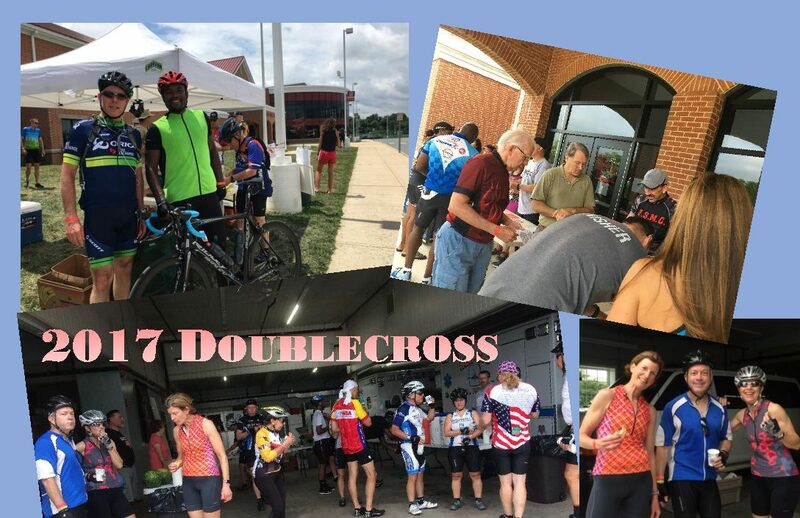 With the guidance of the Major Ride Coordinator, a compliment of helpful, friendly volunteers and the support of the Club this year’s Doublecross was a well-orchestrated event, but there is still quite a bit going on behind the scenes that you may not realize. The first rider pushed off around 6:55 am, while the last rider came into the finish at 3:40 pm, which means SAG support was on the road and available for nearly 8 hours! Temperatures ranged from 77 at 8 am, 80 at 10 am, 83 at Noon, 84 at 2 pm and 86 at 4 pm, which was the highest temp between the start and finish of the event. To make all of this happen and have it happen in such an organized manner it took a Major Ride Director like Dianne Leipold and the 20+ volunteers that she assembled. A great big Thank You goes out to Dianne and Charlie Johnston (co-chair and road markings, SAG coordination), Sylvia Jove, Betsy Lambert, Glenn Nichols, Mary Rock, Brigitte Sheehan Brian Wilkinson, Wes Stafford and Michele Zechman (registration and T-shirt sales); Leigh Belcher, Denise Boyle, Phillip Newman-Sanders, Thalis Pappas, Jose Rodriquez, and Alan Wessel (Leipsic Rest Stop), Mary Clare and Roger Matsumoso (Millington Rest Stop), Susan and Ed McNulty (Smyrna Rest Stop), Cathy Skelley (baked goods), Ken Williamson (food supplies) and Mike Salter, Dave Anderson (SAG drivers). We are always looking for volunteers to help on our major events. We only have four per year, so please consider helping out by volunteering this year. ← Message From the President – Doublecross! !